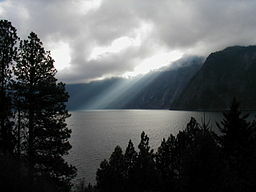 Farragut State Park is located on the southern tip of beautiful Lake Pend Oreille in the Coeur d’ Alene Mountains of northern Idaho. It has dry hot summers, making it a great location for campers. 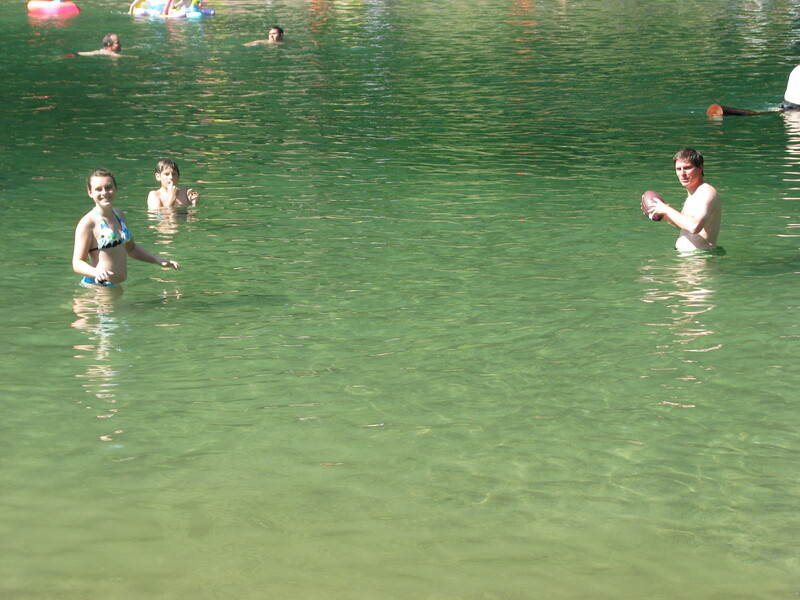 The lake is America’s 5th deepest but has a swimming area at Beaver Bay Beach . This horseshoe shaped sand beach is one of the few places on the lake where the water gets warm enough in the summer for a swim. If you travel with pets make note that they are not allowed on any part of the swimming beach. This park has a lot to offer families. It has disc golf, a radio-controlled airplane field, fishing, swimming, hiking, biking, equestrian facilities and even some World War II history as well as being 20 miles from all that Coeur d’ Alene has to offer. My thoughts of the campground. Recommended Sites: We stayed in Snowberry Campground during our visit. All the sites were all a decent size and the washrooms were clean and centrally located. The draw back for Snowberry was it is a long way from the beach. If you can, try to get in Gilmore Campground as your first choice followed by Whitetail, Waldron and then Snowberry. Each loop has its own centrally located washroom and shower house that were clean and well kept. Most of the back in sites are well treed for privacy and the pull through sites are a bit more open. The campground does have great photos of each site on line so just try to book one close to the beach and maybe away from the access roads. Great weather. Hot but dry…not an overly sweaty hot. Nice campground. 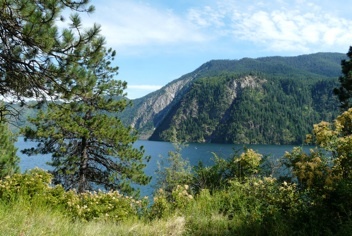 Sites are semi private like British Columbia Provincial Parks, brush and trees between sites. These sites have clean paved roads, and many are serviced with water & electricity. The washroom have flush toilets and clean showers. Ride your bike to park amenities such as Frisbee golf, a model airplane field, or discover old remnants of a World War II naval base. Yes, a naval base located 350 miles from the ocean! They did their training well away from where the Japanese navy or air force could reach. The Beaver Bay swimming area was built by boy scouts in the 1960’s and is actually really impressive! The bottom of this bay is lined with plastic like a swimming pool so the water stays weed-free. The lowlight is that this is not only the best, but possibly the only, part of the lake to swim in. That makes it a bit over crowded. Also, there are a lot of big rocks on the bottom, presumably to hold down the plastic, and we bumped our toes a fair bit while playing in the water. There is not a dog beach so we had to keep going back to the campsite to check on ours. 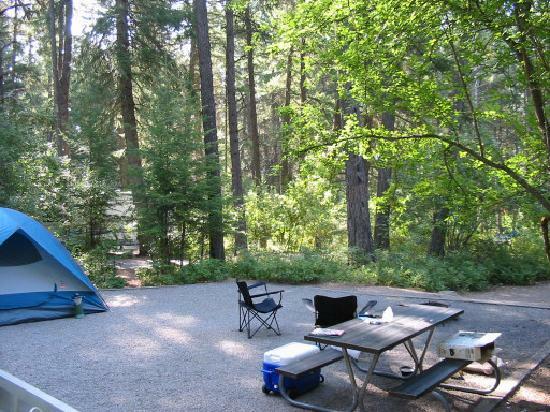 Its a very large campground so some sites are a long way from the beach or other amenities. Enjoy the lake. You will swim at Beaver Bay like everyone else. Lots of boats were on the lake. Fishing looked popular and river rafting companies are located nearby. Frisbee golf. There are 3 courses here, all in the peaceful forest and you can walk or ride your bike to them. If you like real golf, then the Coure d’Alene Resort Golf Course has a famous Island Green. Its just 35 minutes away. We have a horse at home, but don’t take it camping. If we did, this park has equestrian trails and I bet they are beautiful. Hiking, there are miles of hiking trails right in the park. 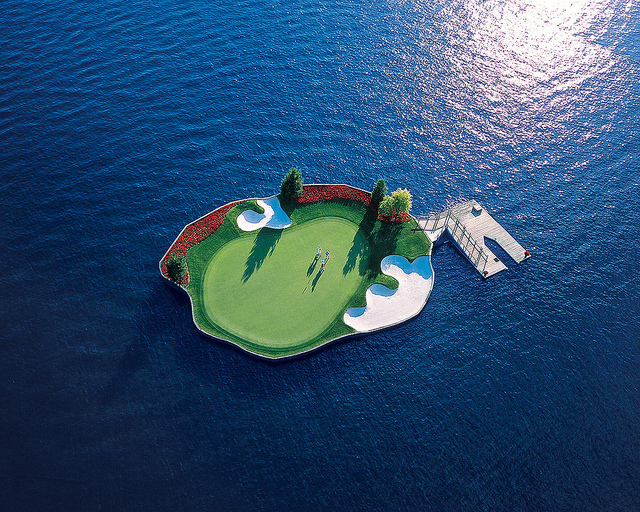 Island green. You boat from your tee shot. 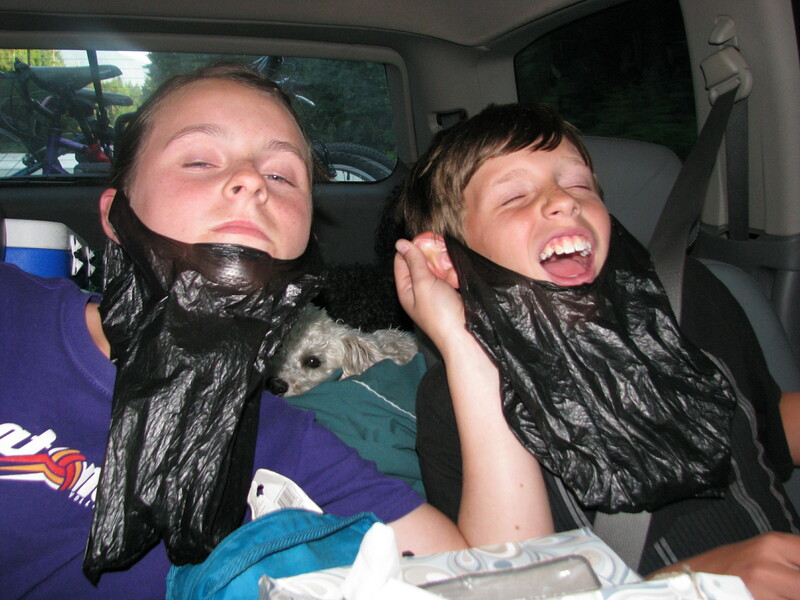 During the summer of 2010 our family headed out on a 2 week camping trip through the North West States. We started on the Oregon Coast and then headed over to Boise, into Yellowstone,the ended at Farragut State Park in Idaho. We selected this park to be our last stop because the area has a lot to offer: the scenic campground has a swimming lake, the climate is nice and warm, and there is a great amusement park for the kids to finish their vacation off on a fun note. 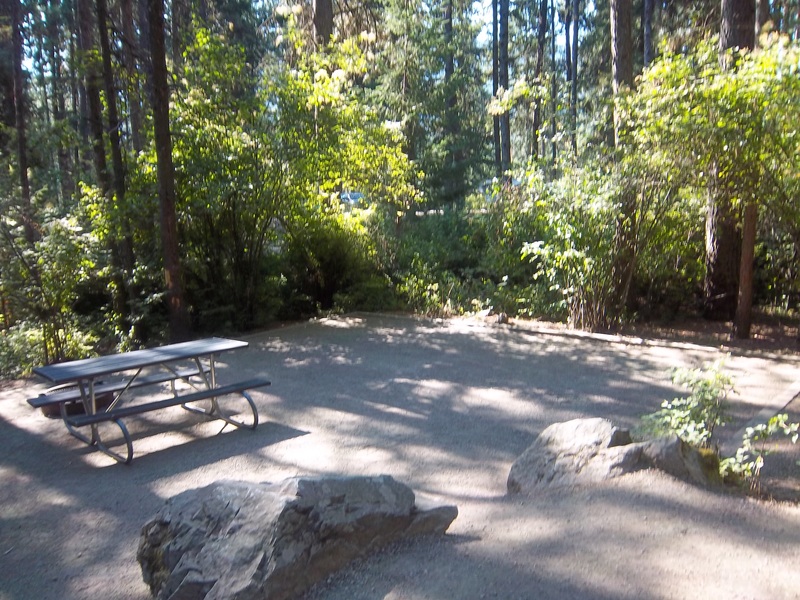 The campground was very clean and well kept, with electrical and water hook ups at our site. We had just left Yellowstone so we very happy to be at a campground that was warm and offered some of the modern conveniences. The kids were anxious to swim so we spent one full day at the beach and the evening enjoying the campground. The lake is deep enough that back in the day they held World War II submarine testing in it. That depth makes it quite cold to swim. For that reason the Boy Scouts made a swimming lagoon which is attached to the larger lake. Being man made is good because there were no weeds and the sand was nice as well it was much shallower so it allowed the sun to warm the water. As a family we played in the shallow water but, as mentioned, there were a lot of large rocks on the bottom that we kept tripping over so that wasn’t great. The spot was also very busy so finding a place to relax was a challenge as the water play area was crowded. That evening my husband took our son to the disc golf. It was after dinner when they rode bikes about 10 minutes to the course. They assumed the 9th hole would return to the starting point so they could then head back to camp before dark. Turns out the 9th ends up deep in the woods, with holes 10-18 leading you back out again. They were losing daylight so had to stop at 8 then literally run the course back to their bikes before it became too dark to travel. Highlight: passing a mother deer with 2 fawns on hole 7, but then having to run by them again but this time with nervous Papa Deer thinking they were attacking. All they could think of was this video from nearby Cranbrook, BC! Luckily, they made it out of the bush alive, and pedaled furiously to get back to camp just as it became dark. From there it was an evening by the camp fire laughing at the deer stories. The next day we headed to Silverwood Theme Park. We thought it would be fun to end the trip with an amusement park. We were not disappointed. 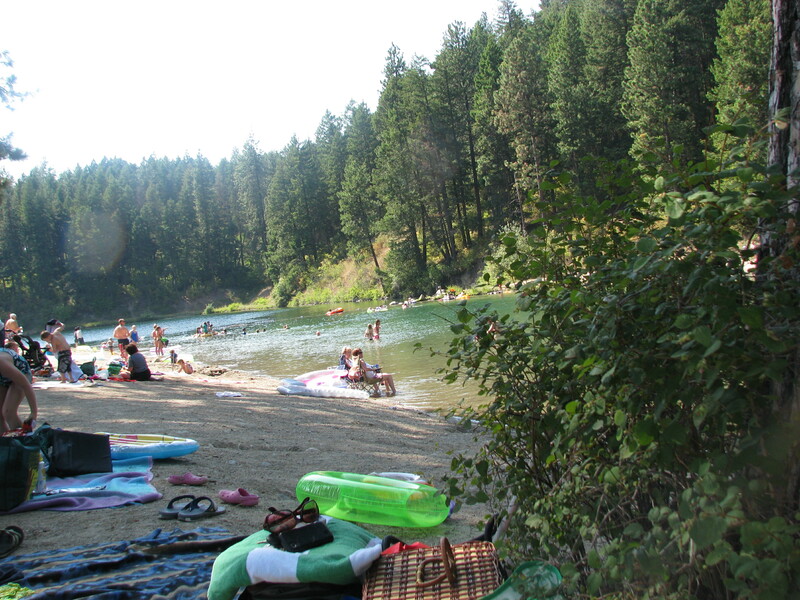 We headed to the Silverwood right at opening and planned to spend all day and evening there. To avoid worrying about our dogs we were able to find Kickaboo Kennel very near to Farragut that took the dogs for the day, this took a lot of the worry away and allowed us to enjoy our time. We weren’t overly impressed with that kennel to be honest, but everything was OK. They don’t have a website, so we’re leaving a YELP link for your reference. Note someone left a very bad review. Once at the park I realized roller coasters were crazy scary. I can remember standing in line for one of them, my palms sweating, thinking what on earth am I doing this for. Never the less, I did it and the kids were thrilled their parents did every ride in the park. It was a great day and I would highly recommend adding it to your trip. 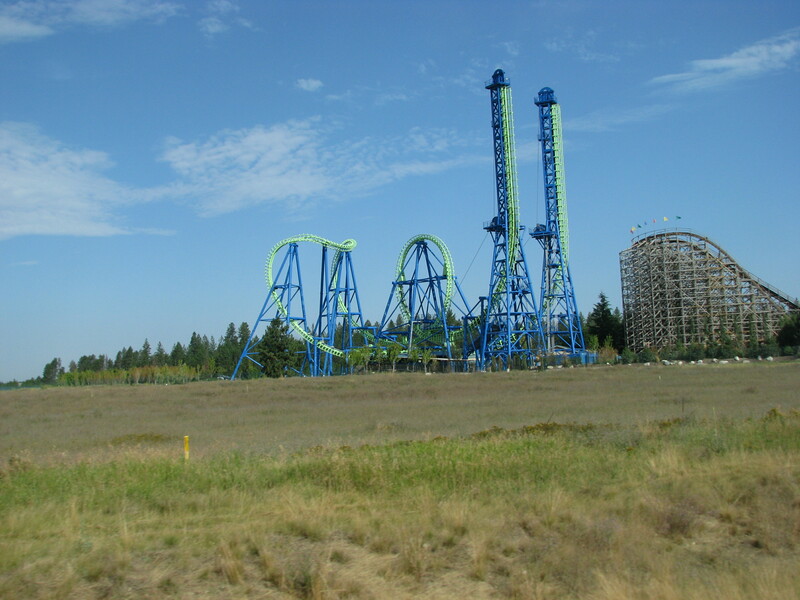 Silverwood has both an amusement park and water park (Boulder Beach) in one admission. We had been to a great water park the week before in Boise so, due to limited time, we decided to only hit the amusement park and leave Boulder Beach for another trip. It must be fun because the slide line ups looked steady all day. All in all, Farragut State Park and the surrounding area made for a great vacation spot. We did not get to all the activities we had read about so this is an area we would like to go back to and we would not hesitate to stay at this State Park again. We loved this campground as well, I think we were in Whitetail Campground as our site backed on to a trail leading right down to the beach – was a bit of a hike! It seemed like there was quite an elevation difference from the campsite to the lake – but my memory is not as good as Shannon’s re: camping trips! From the map, it looks like we were in 59 or 60ish – lots of privacy, very shaded and green. The folf is world-class! If you don’t already have Frisbees stashed in your camper, you can purchase them at the Visitors Center – from cheap $2 ones to much more costly competition discs. We know folks who started camping at Farragut to be close to Silverwood, but then eventually went every summer just to enjoy the camping. Thanks for your feedback, it is nice to get a few more details in the campgrounds. If you have a desire to write a blog for any other campgrounds in your area send me an email or Facebook message and I can send you a link. I would love to get reviews on the campgrounds down your way. Maybe see you in July at the reunion.